The Flower features 10 spacious rooms, accommodating 2 to 4 persons, each with its beautiful balcony, and all overlooking the spectacular garden & swimming pool. The Flower is located at the entrance of Ia, the most beautiful village of Santorini. An ideal destination for a stay or a stroll, Ia is a village of unique aesthetics, dipped in candy like colors and spread amphitheatrically at the top of the caldera. 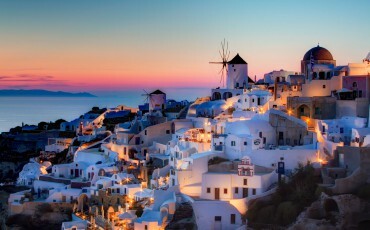 We welcome you to the island of Santorini. The island that will fascinate you with its natural beauties, captivate your heart with its unique sunsets and give you unforgettable moments and memories. The Flower is located in the beautiful village of Ia, with a splendid view of the Aegean Sea and the islands of Ios, Sikinos and Folegandros. The Flower is a family oriented establishment with a warm, peaceful & relaxing atmosphere, surrounded by a wonderful garden. If you are looking for peaceful vacations this is the place to find it. Flower Pension is the ideal place to free your mind. Relax all day long at the sun beds and enjoy the endless horizon of the Aegean Sea and the surrounding islands around like Ios, Sikinos and Folegandros. The flourished garden with the stunning flowers completes the calm and quiet atmosphere of the hotel. What makes it most ideal though is that whenever you desire to hang out with the crowd you can do it any time, since is just a few minutes’ walk from the gorgeous main street of Ia. Flower is a wonderful option for families, appealing to both children and parents, with a pool area ideal for children who loves to play in the water all day. The spacious, flat garden makes it also a safe place for them to play around. Your whole family is sure to enjoy the stay not only because of the beautiful space but also because of the people who go that extra mile to make sure you have a wonderful vacation.